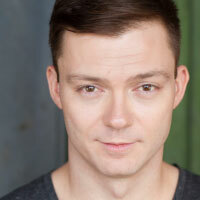 NICHOLAS HARAZIN Chicago credits include work with Paramount Theatre, Chicago Dramatists, Steppenwolf, Chicago Shakespeare, and Back Room Shakespeare Project, among many others. Regionally, he has performed with Milwaukee Repertory Theater, Santa Cruz Shakespeare, International Irish Theatre Festival, American Players Theatre, and more. TV and Film include Chicago Fire, Chicago PD, FOX’s Proven Innocent, and the independent film Thanksgiving Guest. In his spare time he builds custom furniture. Many thanks to Becca and Vanessa for this adventure and to Eleni for being baller.